One of the easiest changes you can make when it comes to health and happiness with your family is laughing more. It costs nothing, takes little time, and who doesn’t love a good laugh? 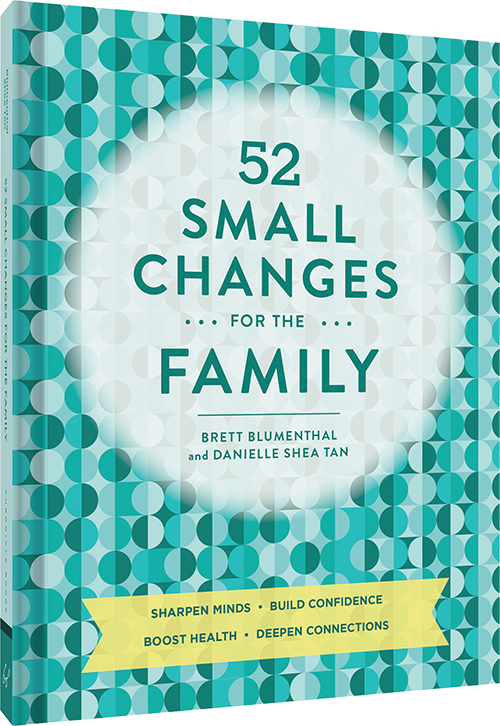 In my forthcoming book, 52 Small Changes for the Family , I’m talking about some of the changes you can make for a happier, healthier family. And one of the simplest changes you can make is laughing more. Research shows that laughter protects the heart and improves vascular function by decreasing arterial stiffness and lowering cortisol, a stress hormone. It also boosts the immune system, stimulating the production of natural killer cells, a type of white blood cell that inhibits infection. But beyond that? It just feels good. One key way to laugh more is to read funny books. The barrage of kids’ and young adult books can be overwhelming, and of course everyone has a different sense of humor. But just in time for the holidays, we wanted to share our top books for getting the whole family cracking up. Happy reading! The Paper Bag Princess (Robert Munsch): A decidedly feminist take on the fairytale, this book has a great lesson and a twist ending that’s sure to get kids giggling. Double Trouble in Walla Walla (Andrew Clements): A simple story about a girl warbling her words, the beauty of this story is in the reading. (It takes a little practice!) Kids go crazy for the silly words and you’ll have them rolling around with laughter by the end. The Book with No Pictures (B.J. Novak): No pictures, all words–this book relies on kids giggling over their adults saying silly things because they absolutely must. After all, they’re written down. President Taft is Stuck in the Bath (Mac Barnett): Loosely based on presidential legend, this book talks about the time President Taft got stuck in the bath–and how his cabinet got him out. (The First Lady saves the day, of course.) Kids crack up over the illustrations. Creepy Pair of Underwear (Aaron Reynolds): A cute and funny tale of a bunny conquering his fear (of a creepy pair of underwear), this one’s always a hit. Kids will laugh just at the word underwear, and there are lots of opportunities for silly voices. Sandra Boynton Books: Sandra Boynton’s board books are famous for their appeal with the super young set, but their word play and fun imagery stand the test of the ages. We highly recommend The Going to Bed Book, Hey! Wake Up, Pajama Time and But Not the Hippopotamus. Smile (Raina Telgemeier): Middle school is hard, and no one knows like Raina. Smile tells the story of a fall that severely injured her front teeth, resulting in braces, surgery, headgear and more–all on top of the normal preteen angst. Middle School, The Worst Years of My Life (James Patterson): Rafe faces a daunting first year of middle school by racing to see how many of his school’s Code of Conduct rules he can break. With a funny main character and in-text illustrations, this is sure to make your older kid smile. Matilda (Roald Dahl): Can you say classic? For a book that bonds parents and their kids while also bringing about smiles and giggles over its absurdity, no one beats Roald Dahl. Bonus: follow up the book with the classic movie for even more laughs. Frindle (Andrew Clements): If your kid likes Double Trouble in Walla Walla, Frindle is his or her next step. Clements continues with his silly made-up words when main character Nick decides to start calling a pen a frindle, and the idea catches on. Tales of a Fourth Grade Nothing (Judy Blume): Any Judy Blume book is a classic that will get kids laughing, but this is a great one for older siblings, who will crack a smile at the sibling rivalry between Peter and his little brother, Fudge.